On 18th October the Sixth Form team hosted a Speakers for Schools lecture in K Library, introducing Dr Fran Cardells, a senior business executive in the technology industry, who talked to the Sixth Form about ‘The Future of Work’. Harvard-educated, with experience of working at Google and now a Strategy Director at Salesforce.com, Dr Cardells is keen to inspire students to develop their skills in the digital age. 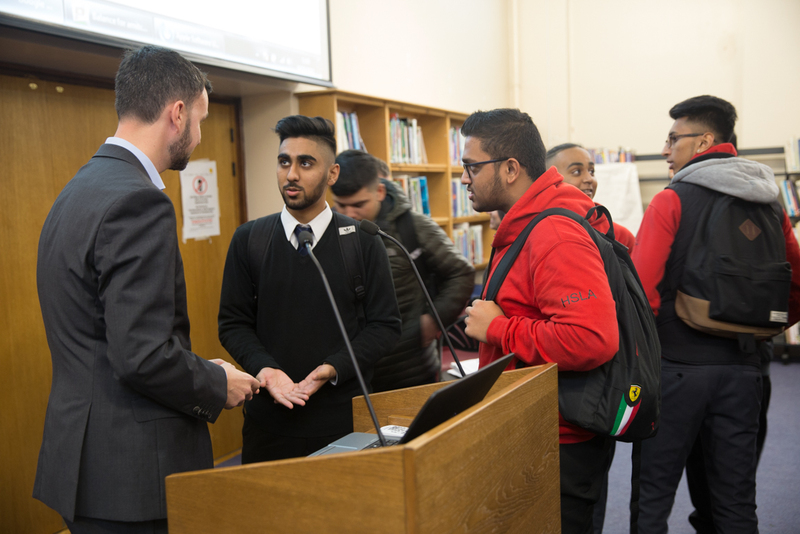 He engaged the large audience of Sixth Form students – drawn particularly from the Business, Economics, ICT and Computer Science subject areas, but attracting a great deal of general interest – with his thoughts on new ways of doing business, new approaches to education and thinking ahead about careers in the 21st century. It was a thought-provoking lecture and Dr Cardell’s clearly captured the imagination of our students. This was particularly evident at the end of the lecture when students lined up to ask questions and discuss aspects of the talk with our guest. In feedback at the end of the lecture, students were keen to express their enthusiasm for hearing the views of business leaders, particularly in the technology sector, and many had taken notes – one student, with an interest in Business Management and Information Systems, was quick to discuss the lecture in his UCAS personal statement! The Sixth Form hosts a series of lectures each year for students as part of its enrichment provision and preparation for university life and the world of work. This entry was posted in Kingsbury High School and tagged sixth form talk, speakers for school by kingsburyhighlondon. Bookmark the permalink. Many thanks for hosting me. Delighted to be at Kingsbury.